You are walking your dog and he needs to poop. Just as he is in mid-elimination mode, you realize you forgot to grab a plastic baggie. Oh poo…. This HAS happened to me. With two Labradors (Lucy and Molly) it was bound to happen. I have had to run back into the house, grab a bag and run back out to clean it up so that people didn’t think I was a “bad dog mommy”. It’s really annoying, especially if you also have a little one (or two) in tow. Rascodog has a brilliant solution. Why not just put the baggies in the leash handle? Yes, we have seen those little baggie-holders that attach to the leash. Those annoying little bags dangling from the collar that can be hard to get into. I’ve tried those. It seems like I need one hand to hold the dog, one hand to open the little baggie-thingie, and one hand to pull a bag out. Wait, that’s 3 hands…. With the Rascodog ReadyLeash system all I had to do was pull a bag out of the handle. Plus the bags are biodegradable and decompose in less than 1 year under normal landfill conditions. Anything to help the environment is good! My husband tried the Rascodog ReadyLeash out while taking Molly for an evening walk. Molly tends to “wander” a bit. We were very relaxed in training our dogs, basically we just want to keep them out of trouble and close by (they are good doggies), but “heeling” didn’t seem necessary. We ALWAYS have them on a leash though. The Rascodog ReadyLeash is nice that it is fully adjustable in length. The specs claim that it is 4 feet, but I held it up next to me and it is easily longer than I am all (I’m 5’6″). So Molly can roam a little bit but still be close enough that I (and my husband) are comfortable. The Rascodog ReadyLeash handle is nice and thick – I feel like I have a good grip on it. That’s a nice feeling to have when you have a 100lb dog on the end! 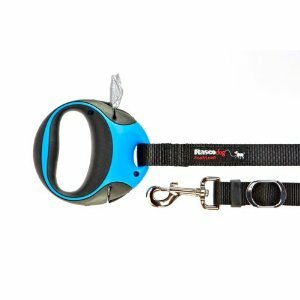 One thing to note – Rascodog ReadyLeash is NOT retractable. Which is a good thing. My husband didn’t think so until Lucy zipped the leash and burned my husband’s fingers with the friction. There is also a danger of tightening around limbs/fingers/doggie legs. We used to use them but no more (you can read more about why the Rascodog ReadyLeash is not retractable HERE). Rascodog is committed to providing products that promote responsible dog ownership. Their ultimate goal is to create innovative pet products that make it convenient to take proper care of your dog and your neighborhood. They design, manufacture and offer innovative, high quality and eco-friendly products that meet the demands of our customers and our customers’ best friends. Visit Rascodog to purchase your own ReadyLeash or find out where you can buy a Rascodog ReadyLeash HERE! 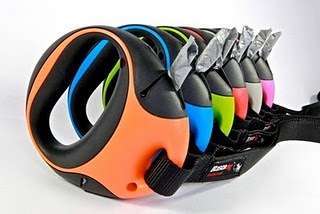 One lucky reader will win a Rascodog ReadyLeash in their choice of color and size! Available sizes are 5/8″ and 1″ and colors are HERE! I got the tangerine and love it! Visit Rascodog and let me know your favorite color and the lucky doggie who you want to win it for! Subscription MUST be completed and will be verified! Giveaway ends Sunday Aug 8 at 11:59pm PST! Winner will be determined via random.org and must respond to my email within 48 hours with shipping info!